The 'California Panther Lily', is among the easiest to grow of the Western U.S. natives. 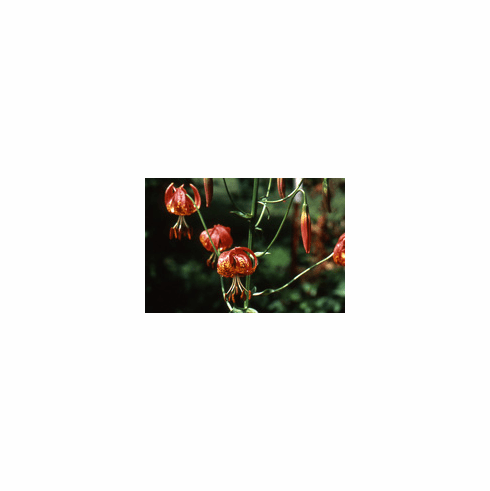 The "wild scented" Turk's Cap flowers are orange-red in color and often have red tips. The nectary furrows are green on these black spotted flowers. Considered a small flowered version of Lilium harrisianum, it requires a damp, lime free soil with full sun. Lilium pardalinum played an important role in the development of the 'Bellingham Hybrids' by Dr. David Griffiths at the old USDA research station in Bellingham, Washington. The Bellis Fair Shopping Center currently occupies the site of the old research station. Photo insert #1 was taken by Hannah Kang who has several photos shown on this site. Taken in Marion County, California in natural habitat. Source CalPhotos. Copyright Hannah Kang, all rights reserved. Used with permission. Photo inset #2 was taken in the late 60's and is of the Griffith Bellingham Hybrid 'Shuksan'. We found 'Shuksan' to be a real animal in the garden, far more easily cultivated than either L. pardalinum or L. humboldtii, the parents. 'Shuksan' was introduced in 1924.